St Mary’s Church, Fratton Road, Portsmouth, PO1 5PA has received initial National Lottery support for The Organ Project. We are now preparing the bid for the major Phase two. There will be a retiring collection in aid of The Organ Project. Further details will be made available closer to these dates. Entry is free and there is a retiring collection. Development funding of £32,100 has been awarded by the Heritage Lottery Fund to help St Mary’s Church progress its plans to apply for a full National Lottery grant in 2019. The goal is to fully restore the Victorian organ to its former glory, to the tune of more than £850,000. The Organ Project celebrates the heritage associated with 125 years of music making in St Mary’s Church, Portsea. The unique 1889 Walker pipe organ is at the heart of life within the Parish, but is now in a critical condition where interim repairs are no longer sufficient to keep the nationally significant instrument from being lost. The project will engage with local communities, develop volunteer skills and enthuse visitors with an exciting activity and education programme, interpret the organ’s history, science, sound and function, and make a lasting difference for heritage, people and communities. St Mary’s Church is a focal point for the local community, explored by many different groups and communities within the city and further afield. It reaches out to its numerous parishioners and visitors, through its open door policy: welcoming the local community to use its extensive building as a place for non-denominational reflection, music making, education and social activities. Completed in 1892, and made possible in part, through a generous gift from W.H. Smith II, First Lord of the Admiralty and founder of the widely known stationery chain, St Mary’s Church has a rich and diverse history. 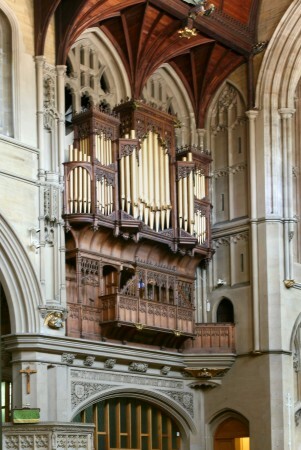 The intricate oak organ case, dedicated in 1901 to those who fell in the Boer War, will be researched and presented by a team of volunteers, to provide a unique interpretation of heritage history.